Two things have become apparent since DC/Warner Brothers have decided to drop their forced continuity in their films- They have become very good and a whole hell of a lot of fun. Shazam! was an incredibly fun two hours of my life and perfectly satisfied what I wanted this movie to be. As I wrote earlier the original Captain Marvel, or Shazam as he is known today, was and is an important character in my comic origin story and I had high hopes for this movie. I worried that Shazam! would be hard to translate to a mass audience, that the tone could be too dark or become to comedic but after a few minutes my worries were no more as Director David F. Sandberg set the perfect tone for this movie and his cast did an incredible job of bringing his vision to the silver screen. It should be stated up front that classic Captain Marvel fans may have issues with Shazam! as the film relies heavily on the modern Geoff Johns interpretation of the character. 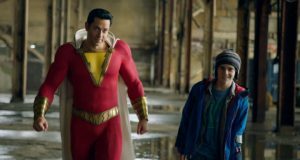 Not to say that the movie is devoid of the classic feel but the personality of both Shazam and his young alter ego Billy Batson’s roots are clearly established by the comics of today than those of the ‘40s. Yet to connect with a modern audience these changes were the right decision, Billy Batson of the ‘40s always seemed to cheerful for being an orphan while the Billy (Asher Angel) of Shazam! is full of anger and angst, which is a far better representation of today’s youth. While in the comics Billy’s parents are deceased in Shazam! Billy’s searching for his mother, who he sadly believes thinks he ran away when he was a young child and became lost from her at a carnival. Billy is sent to a new foster home where he quickly begins planning his escape even as his new foster family, most notably his super hero obsessed foster brother Freddy Freeman (Jack Dylan Grazer), try to make his transition easy and show him that this foster family is different, that they actually care. 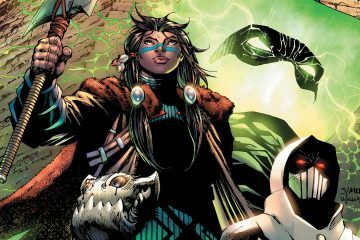 The origin is still the classic story, orphan Billy Batson is gifted with the ability to become Earth’s Mightiest Mortal by the Wizard Shazam (Djimon Hounsou). By saying Shazam Billy becomes Shazam (Zachary Levi) an adult super hero gifted with incredible powers. Billy comes to be on the subway while running from bullies who he embarrassed after they attacked Freddy, which is apparently a common occurrence for Freddy. Once Billy becomes Shazam the comedy of the film really ramps up as Shazam! 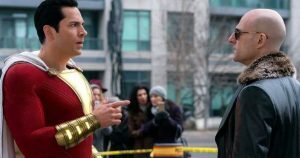 plays on the Big aspect of the film where rather than the classic interpretation of Billy and Captain Marvel being separate people in Shazam! Shazam is a 14 year-old in a grown man’s body and he turns to Freddy to teach him how to be a super hero. Just like a classic sports montage Shazam! uses snippets and short clips of Freddy conducting power tests on Shazam to see what he can do, and he can do quite a bit, as well as seeing him learn how to use his powers. It’s a fun part of the film and really plays with the concept of a young teen given not only super powers but also an adult body, yet the teen mentality and stupid hijinks win out over making sensible adult decisions. The principle antagonist of Shazam! is Dr. Thaddeus Sivana (Mark Strong) and the Seven Deadly Sins that inhabit his body. In a slight tweak to the backstory in the beginning of the movie it is shown that Sivana was offered the powers of the Wizard Shazam but was deemed unworthy and rejected. Sivana then devoted his life to locating the Rock of Eternity and stealing the powers and in doing so Sivana allows himself to become the host to the Seven Deadly Sins and becomes an evil version of Shazam. With the Seven Deadly sins corrupting him Sivana becomes obsessed with taking Shazam’s abilities, which eventually leads to the classic hero questioning their abilities moment and the eventual epiphany that they truly are the hero the world needs. Shazam! is an incredibly fun film and the final act is full of action dripped in heart and fun. Zachary Levi’s performance was incredibly enjoyable and just like Tom Hanks in Big (Which gets a great nod during one of the big action sequences) Levi was able to convey the belief that he was a 14-year-old trapped in an adults body. The new ‘Marvel’ family was also brilliantly cast, not just Grazer who is awkwardly perfect in his role but the rest of the siblings and especially Marta Milans and Cooper Andrews as Rosa and Victor Vasquez, Billy’s Foster parents, brought a loving depth to the surrogate family Billy didn’t even know he was looking for. While there were moments that may frighten younger children all in all it was a great family friendly super hero adventure that will hopefully garner a sequel and maybe the long-promised Dwayne Johnson Black Adam. Verdict: Shazam! is an incredibly fun movie and a great addition to the new DCU that is finally on the path of making great super hero movies with their incredible catalog of characters.